We have jotted down a list of some of the best earphone and portable speaker deals on Amazon. This includes devices from brands like JBL, Sony, and boAt. This deals roundup is for those who are looking for a portable speaker or earphone to enjoy their music on the go. 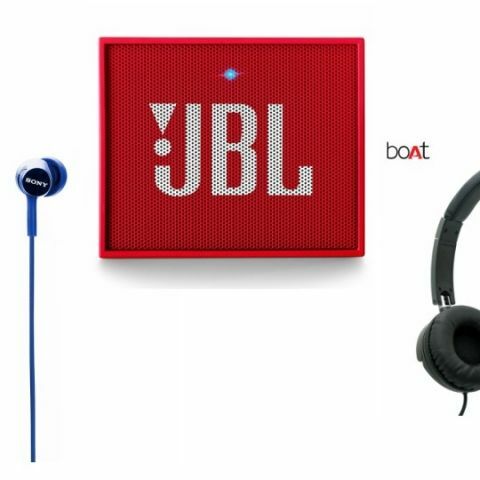 The products we have covered are from brands like JBL, Sony, boAt and more. The Sony MDR-ZX110A headphone is for those who prefer on-the-ear headphones. The device comes with a swivel ear cup design that enables easy portability. It also features a tangle-free flat cable that should reduce the chances of the cord getting knotted. You can purchase this device here. The boAt Stone 200 is a waterproof and shockproof Bluetooth speaker that lets you stream music via AUX and USB cable as well. It features Bluetooth 4.1 connectivity and is equipped with a 1500mAh battery, which as per the company, can provide ten hours of playback on a single charge. You can purchase this device here. The JBL Go Portable Bluetooth Speaker is compatible with both iOS and Android devices. This small and compact device features Bluetooth 4.1 connectivity and according to the company can provide five hours of playback. The speaker is available in seven colors such as yellow, blue, grey, red and more. You can purchase this device here. The Sony MDR-EX150AP comes with an in-line microphone and remote to manage audio tracks and calls. The earphone box includes a wire-manager helps ensure that the wires don’t tangle up in knots. The earphone is available in more than six colors such as red, blue, grey, pink and more. You can purchase this device here. The boAt Bassheads 900 features a tangle-resistant cable and comes with an in-line microphone and remote to control music playback and calls. The device ear cups are foldable, which makes this headphone easy to store. You can purchase this device here.